When you speak to people about their website and you ask them what their main trouble with their website is, generally they tell me and many others that their website just isn’t doing anything. They don’t have enough visitors, they don’t get enough leads and they just don’t have a lot of traffic to their site. So how do you get more people to your website without paying and without spending an arm and a leg to get them there? 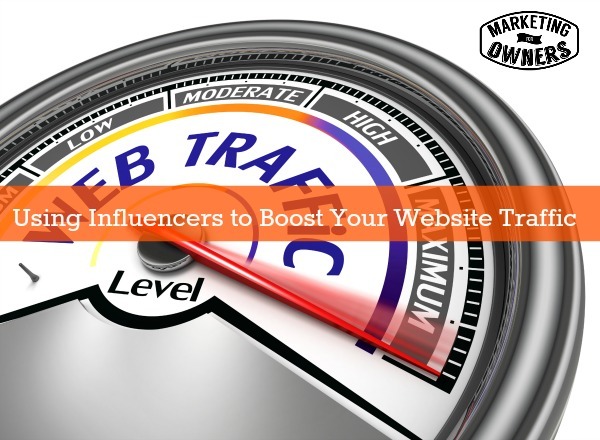 So — here is the easiest way to boost your traffic. It’s all good getting new visitors to your site, but unless they are relevant and the right type — aka “potentials” (from our 5 p’s of marketing), it is wasted. You could have a million visitors to your site each month, but if they are not interested in what you do and what you sell, there really is no point in them being there, right? They are just taking your bandwidth. Let’s use my fire extinguisher business for this one — we sell fire extinguishers online, so we would look for fire safety, fire extinguishers, things like that which are main products. Your weekend challenge is going to involve the above, so let’s get started! 1. 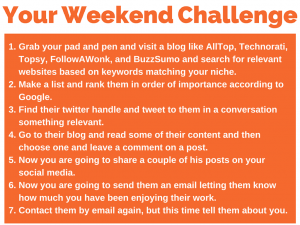 Grab your pad and pen and visit a blog like AllTop, Technorati, Topsy, FollowerWonk, and BuzzSumo and search for relevant websites based on keywords matching your niche. For me, I could type in fire safety and it will show me all kinds of blogs about fire safety, but don’t forget to search for people in your list as well. Once you find those top influence words, you are going to add them into a spreadsheet. Put them in Column 1. 2. Make a list and rank them in order of importance according to Google. Now that you have a list of places to find relevant sites to visit, now I want you to make a list of at least 5o, but preferably 200, different blogs in your niche. Once you have that list, I want you to create a local list of websites or businesses from that 200 that you put together. They must be active, which means that they will have influence. Now you are going to rank these in order of web importance according to Google. Once you have this, then go to Moz.com and find out their ranking according to this website. Enter their Moz Rank into your spreadsheet and then re-sort them in order of importance. Once you find their twitter handle, you are going to then watch what they are talking about on Twitter, and then you are going to tweet them and get into the conversation. Make sure it is something relevant and relateable to what they are talking about. You are going to do this 3 or 4 times for every single person. Make your comment relevant. Don’t just say “great article”. Use good words and tell them how the article spoke to you and how you plan on using it in your business, etc. Take some time and share a couple of their posts on your social media. Once you do, be sure and then go back to Twitter and send them a tweet letting them know you loved the article and you shared it. 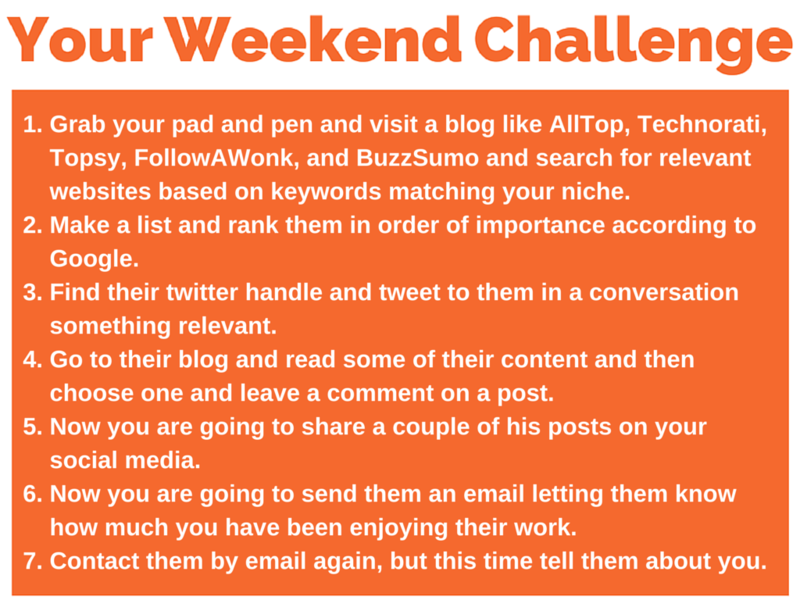 Step 6: Now you are going to send them an email letting them know how much you have been enjoying their work. Shoot them an email letting them know how much you have enjoyed reading their website, and how you plan to use what you have learned to further your business. Now that you have told them all about how much you love them, now it’s time to sell yourself. Write them another email talking about how much you love their work, and then introduce them to your work. Now that you have done all of this, you have created and started a relationship that will not only help boost your traffic, but also grow your business. Have you started your influencer list yet?